As my sweet agave, I do love you so. Sometimes thought to be a cactus, it's actually closer to being a lily or amaryllis. This plant has a lot of great uses. 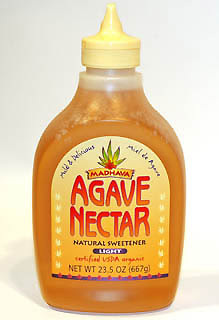 Right now I'm relying heavily on agave as my only form of sweetner, which is expressed from the core of the plant. It's then put through several processes which produce agave nectar or syrup. Why you should care about this is because this sweetner has a very low gycemic index- meaning it won't cause your blood sugar to spike and then drop. I use it to sweeten my coffee or tea and my oatmeal and never feel that roller coaster. Granted, I don't use very much, but its mild flavor goes a long way. Vegans and raw foodists like agave because it doesn't come from any animal (think honey from bees- some vegans believe this is exploiting bees) and it undergoes minimal processing to produce either light or dark nectar. It is also a very effective sweetener for cold beverages such as iced tea as, unlike sugar and honey, it dissolves readily in cold liquids. Bonus! Know why else you care about agave? It's the source of TEQUILA! I have long loved good quality tequila (hello Don Julio Anejo- the BEST! )- Agave, I appreciate your contributions to this world. 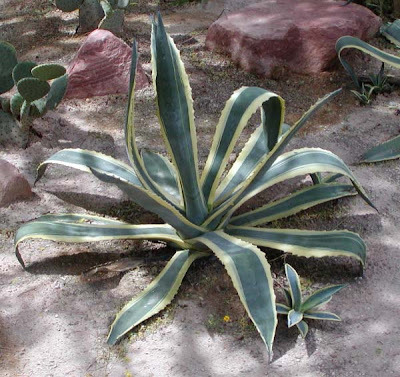 -Each agave plant will produce several pounds of edible flowers during the summer. -The leaves may be collected in winter and spring, when the plants are rich in sap, for eating. -The stalks, which are ready during the summer, before the blossom, weigh several pounds each. Roasted, they are sweet, like molasses. -During the development of the inflorescence there is a rush of sap to the base of the young flower stalk. In the case of A. americana and other species, this is used in Mexico and Mesoamerica in the production of the beverage pulque. -The flower shoot is cut out and the sap collected and subsequently fermented. By distillation, a spirit called mezcal is prepared; one of the most well-known forms of mezcal is tequila. -When dried and cut in slices, the flowering stem forms natural razor strops, and the expressed juice of the leaves will lather in water like soap. -The Natives of Mexico used the agave to make pens, nails and needles, as well as string to sew and make weavings. In India the plant is extensively used for hedges along railroads. -When dried out, the stalks can be used to make didgeridoos. Definitely a great, useful plant. Enjoy!